Blogger.com is one of the most simplest platform and easy to use base on how it was being built. Having a blog is very important and also adding a label to your post is a nice idea that allows your visitors to be able to get the right information properly without any issues. So today we are going to be talking on how to add a label to your post on blogspot and make sure you add label to those post which you haven't add to before. 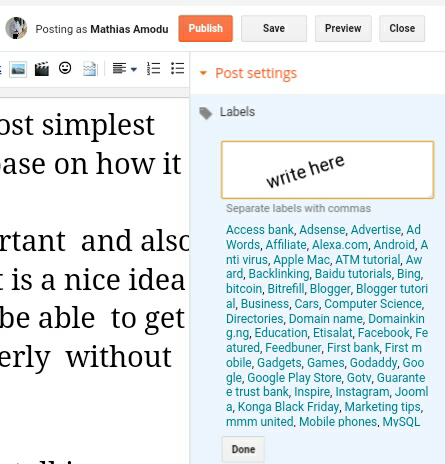 Then add or write all the labels that you would like to categorize your post and Make sure each label is separated by a comma and a space then before publishing your post. Finally try to view your published post, you will see your labels appear at the bottom of your post. Then for additional purpose just click on layout and add a gadget that has many options to list your labels on your sidebar for easy reference and that's all.